This release includes lots of smaller enhancements and fixes. Updates to the following plugins were also released: AWS, Database, File, GraphicsMagick, Json, Utilities and Web. Remove person icon on LinxServer. Improve accuracy of analytics logging. Update to .NET Core 1.1. Create CustomTypes from JSON Schema. Fix generated dll name clashes with installed dll. Show content structure of List in Output window. 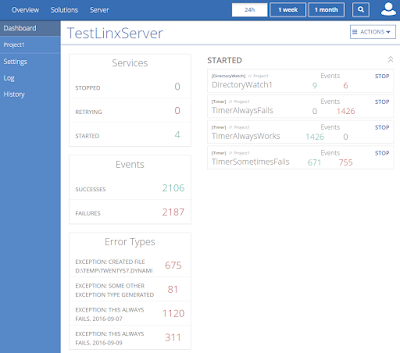 Fix LinxServer service start error message overlays service name. Fix postback error for large error messages. Set max metrics database size. Fix loss of metrics in queue when host is closed. Fix instance of List does not refresh when underlying CustomType is changed. Show LinxServer logs in descending order. Fix wrapping of long Setting values in LinxServer. Allow loading of multiple versions of strong-named dll. Allow assignment to IEnumerable<> properties. Fix double click required to add Service from toolbar. Remove "Are you sure" popups in Linx Designer. Fix IfElse editor does not recognize True or False values. Fix proxy error when clicking 'Start using Linx'. Display underlying type icon for Nullable<> types. Fix installing plugin fails when moving to another window. CallWebService: Encoding XML in string parameter now allows CDATA as parameter values. Fix CallWebService reading wsdl from local file. Support untrusted https url in WebServiceDataCall. Fix MTOM CallWebService does not submit file binary data. Fix BarcodeReader divide by zero error. Change LinxServer ssl cipher to more secure one. Fix LoopTable loses properties if linked to DatabaseRead. Why are we doing this? As Linx is still in Beta, it is critical that we understand our users, provide the right levels of security around access and keep you informed around important announcements. We will not share your email address with anyone. Important information: - The update only applies to Linx 5. - The update will require no further action for users who already have a valid license. - Users who currently do not have a license will be required to verify their email address to continue using Linx. To verify your email address and get your license: 1. Download the latest version of Linx 5 here. You will be sent an email to verify your email address. 2. Once you have verified your email address, you can open Linx Designer. The new start screen will prompt you for your email address in order to continue. Click here to download the latest version of the GetLinx application. It allows you to manage a Linx installation on a computer that has limited or no internet access (the default setting is to pull the latest updates from the internet). It allows you to replicate a Linx environment across multiple machines (similar application and plugin versions). By default, Linx updates (application and plugins) are retrieved from the internet. This application will allow the user to create a local copy of all the necessary update files that can be copied and used in multiple places. This in effect allows him to lock Linx to a specific version and have greater control about when updates will be installed. -p: The base target folder where the plugin and installation packages will be saved. If not specified, a new directory called “Feeds” will be created in the same directory that the application was launched from. Two subdirectories, “App” and “Plugins” will be created inside this directory. -v: The name of a version manifest file that contains metadata about the application and plugins that must be downloaded. If not specified, the latest version of the application and plugins will be retrieved. -i: The target folder where the application installer (exe) will be saved. If not specified, a new directory called “Installer” will be created in the same directory that the application was launched from. -l: The path to a log file. When the application is executed, it will write all of its output to the console, but it can be useful to log the output results to a log file for analysis. The version manifest file is an XML file that contains metadata about the files (application and plugin) that must be retrieved. This can for example allow the user to download only selected plugin files that are necessary in their environment. The file can either be generated manually (see structure below) or downloaded from a preconfigured Linx Server by going to the Plugins page and clicking on the “Download Version Manifest” button. The installation element contains the version of the application to retrieve, e.g. “5.10.550.8839” in this case. If the version is not specified, the latest released version will be retrieved. The plugins element contains a list of all the plugins to retrieve. All plugin entries have a name and a version. If the version is not specified, the latest compatible version will be retrieved. If an incompatible version is specified, a warning will be logged. If no plugin entries are specified, all the latest compatible plugins will be retrieved. Once the necessary files have been retrieved, you must configure your Linx installation to retrieve updates from a local path (and not the internet). To do so, you need a Linx license that allows you to override the default repository settings. Once you have installed the license, open a Linx designer and go to the settings window (File –> Settings). In the “Application update repository” field, enter the path where the application package was saved. If you for example specified a target folder of “C:\GetLinx\Feeds” when running GetLinx.exe, the path will be “C:\GetLinx\Feeds\App”. In the “Plugin update repository” field, enter the path where the plugin packages were saved. If you for example specified a target folder of “C:\GetLinx\Feeds” when running GetLinx.exe, the path will be “C:\GetLinx\Feeds\Plugins”. If you now restart the Linx designer, it will retrieve updates from the local path. This release includes a brand new Linx Server. We now make extensive use of metrics to show you what is happening on the server. Here are some screen shots. The Expression Editor does automatic type conversions for incompatible types. It also allows the use of Linq queries like List.Count() or List.Where(x=>x.Name=="john"). The Database plugin has improved MongoDb support and we've added a MongoDbMapReduce function. The Excel plugin now supports reading ranges from multiple sheets in a spreadsheet, all without needing to have Excel installed. The Web plugin has improved support for wsdl formats and several bugs were fixed. The Xml plugin now supports schemas with names containing illegal characters. We also allow mapping between the names in the schema and the name you want to see in Linx. Fix GetTypeReference bug on DesignerContext for complex expressions. Allow CSharpExpressions on custom types and lists. Check expression result type to determine conversion logic in compiler. Allow xml values in UI. Only allow JSON or XML string values for complex types. Fix WCF error handling between host and service. Display Cut/Copy options on Folder item. Determine expressions return type, automatic type conversion. Fix compiler error when double-clicking on a lsoz file. The working directory was not correct. Add List functions to ExpressionEditor. Fix reference scope bug when moving function in same process. 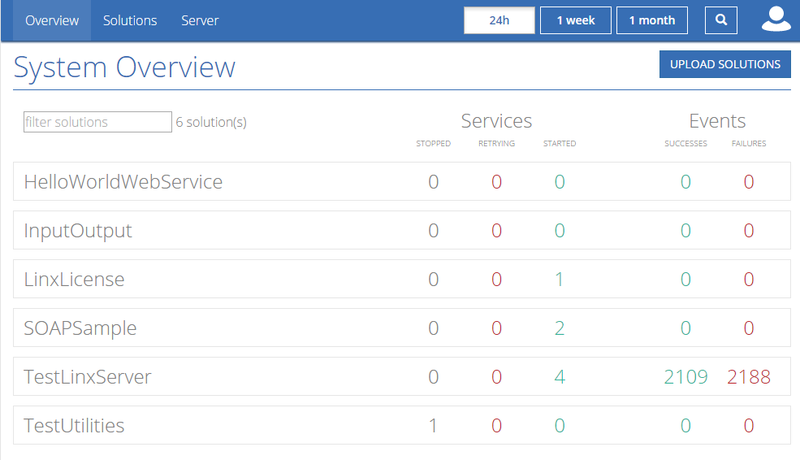 Update LinxServer with new UI and metrics. Allow for simple values in list parameter. Show empty list in debug values. Fix plugin loading bug for mismatched third-party libraries (e.g. Json.Net). Only use compatible NuGet dependencies when querying NuGet package information. Fix signed service not starting. Updated Installer Grey Button styles (for installer, close and uninstall). Changed the button styles of disabled primary buttons in Linx Designer to be greyed out (no background). Upgrade plugins to enable namespaces changes. Fix SOAP Web service response with embedded record not returning results. Compile in temp dir instead of in solution file path. Add Timeout property to SendMailSmtp. Add Timeout property to BarcodeReader. Change tab order of Save and Cancel. Fix compiler error for embedded try-catch. Remove input parameter results in compile exception. Remove "Prefer 32-bit" flag from project. Windows menu is incorrect after floating window. Change name selection when adding a Function. Complete border around property windows. Change border of editor windows to those used by property windows. Fix setting convertion error in designer context. Change ServiceEvent so that it never throws exceptions. Exception on Run window has incorrect layout. Inline solution name edit do not follow file naming conventions. Debug of DirectoryWatch.CreatedEvent throws exception. Change color of debug toolbar. Ctrl-F to focus on Search box. Object reference error when deleting single setting that is referenced. Add Delete and Find References context menu on Settings. Property window blank when click in empty Process. Add variable panel to SQLEditor. Fix ExecuteSql. Duplicate variable in ODBC sql causes error. Remove JsonReader IsList property and add List to OutputType. Fix object reference error when opening days editor with expression value. Fix TimerService. Service stops when next interval is missed. Fix CallSOAPWebService to unwrap TargetInvocationException. Fix SOAPService and RESTService to relay process exceptions. Fix SOAPService. Calling method with "password" parameter does not show input parameter. Enable https calls for old web services. © Twenty57.com. Powered by Blogger.